This lovely lady adds to the delicious egg crop too. Can you imagine how good the eggs are from free grazing hens. I truly find it very hard to eat the pale yolked eggs from a grocery store. The eggs are a little crisper than I had planned but they were delicious nonetheless. The asparagus was from my garden. Des œufs avec des asperges, tu me donnes faim. Mary MacADNski: Real, true food. Mary MacADNski: Isn't she lovely? What a beauty!!!! Your breakfast looks quite yummy! Mary MacADNski: Though it looks like breakfast it was dinner for me. I like my grainy goodness in the morning. She is wearing a wonderful dress Mary! Mary MacADNski: I have a similar skirt. 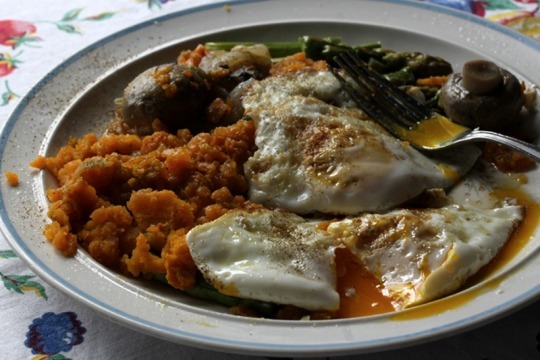 Very much agreed regarding those delicious looking yolks Mary - beautiful isn't she! Mary MacADNski: She is very well cared for. We are fortunate enough to get our eggs from a neighbour with free range chickens. The eggs taste very good Mary. Mary MacADNski: Country living is best for the freshest food. It is amazing to see so many different beauties of hens. The meal looks delicious, I have just eaten asparagus with potatoes. Mary MacADNski: I have been eating asparagus daily as usual this time of year and certainly with potatoes which PEI is famous for. Now I can understand why yoiu get such fine eggs; she's a beauty! I'm eating duck egss at the moment. Mary MacADNski: Country livbing at it's best. You might like tomorrow's post. Nice looking hen, but even nicer looking breakfast. Mary MacADNski: Don't I know it. There has never been a chemical on my own food. "The sky is falling...I tell you!" Mary MacADNski: You can talk all you want.... We have been privileged to finally get rain a few days ago. Let the skies fall - an inch a week. If the eggs were half as good as she looks I am sure they were delicious. A pond life update: No ducklings but I did see we have a couple of moorhen chicks this morning. Not on the water yet so I hope they survive. Mary MacADNski: I am not familiar with moorhens but can picture them from photos here. I know nothing of their habits. I have pond news too. A beaver has come on my side. Mary MacADNski: I could eat one if I didn't cook it. But gosh, I would never buy supermarket eggs. Is she a Barred Plymouth Rock, Mary? We had one named June after my mother in law who was born in Plymouth. Mary MacADNski: She probably is as that is a popular breed. They have lots of variety in their hen stock. Mary MacADNski: All fresh and new. My garden has been abundant.